Article originally posted at www.utsa.edu. Full copyrights held by original publisher/author. Each summer Catholics from across the world embark on a days- and often weeks-long procession from dozens of towns throughout Poland to the Jasna Góra Monastery in Częstochowa, a shrine considered by many to be the country’s spiritual nucleus. On August 15, the Feast of the Assumption of Mary, tens of thousands of pilgrims crowd all roads leading into the city to filter through the famous monastery’s Chapel of Our Lady, past the discarded crutches and ex-votos of the miraculously healed, and offer up their own most profound hopes to the image of the Black Madonna of Częstochowa. Staring not back at them, but through them with a piercing gaze, the dark-skinned Virgin Mary bestows her famously just blessing on these and the nearly five million devotees that visit Jasna Góra every year. The pilgrimage, part of a centuries-old tradition, is an enduring expression of Catholic worship. Thousands of Black Madonnas in the form of paintings and statues are venerated in countries like Spain, France, Italy, Switzerland, and Russia, their shrines representing the world’s most famous and frequented Marian (that is, centered around the Virgin Mary) sites. While most of the icons are concentrated in Europe – and particularly in the Mediterranean – they are also found in the Americas. Our Lady of Guadalupe in Mexico is one such example that, like the Black Madonna in Poland, serves as a vital aspect of the country’s religious pulse. Yet for all her prevalence and influence, the Black Madonna remains a surprisingly misunderstood figure in mainstream Christianity. Too often, racism and ignorance obscure her true origins. One common account of the Black Madonna in France’s Chartres Cathedral holds that her skin was once white, but became dark over the centuries due to exposure to candle soot. This theory, although easily disproven, is accepted in many locations throughout Europe. In other cases, icons have been purposely whitened, such as in Rome’s Santa Maria del Popolo Church, where the representation displayed in the main altar has been bleached, while the same image on the choir altar remains black. In southern Spain, the icon of the Virgin of Regla, originally a single wooden statue, was split in half to separate the Jesus figure from its mother under the pretext of clothing the Madonna with luxurious robes – except that a white Christ Child, rather than the original dark-skinned version, was put back in its place. Given this frequent practice of cultural whitewashing, it comes as no surprise how little is known about the actual identity of this enigmatic figure. As Dr. Oleszkiewicz-Peralba explains, the Mother Goddess, revered throughout all of human history in forms that change according to time and culture, represents the essential state of reality, that which gives birth to all of material existence. “She is the mother of universes, identified with the primordial darkness and chaos of the universe, and with the moist and fertile black earth.” Her many historical incarnations include the Roman goddess Ceres, the Anatolian and Roman Cybele, Artemis in ancient Greece, Kali in India, and the Ancient Egyptian Mother Goddess Isis. Like the Black Madonna, these and a host of pre-Christian goddesses associated with the earth and fertility were commonly depicted as crowned, seated on a throne, and holding a divine child on their lap. 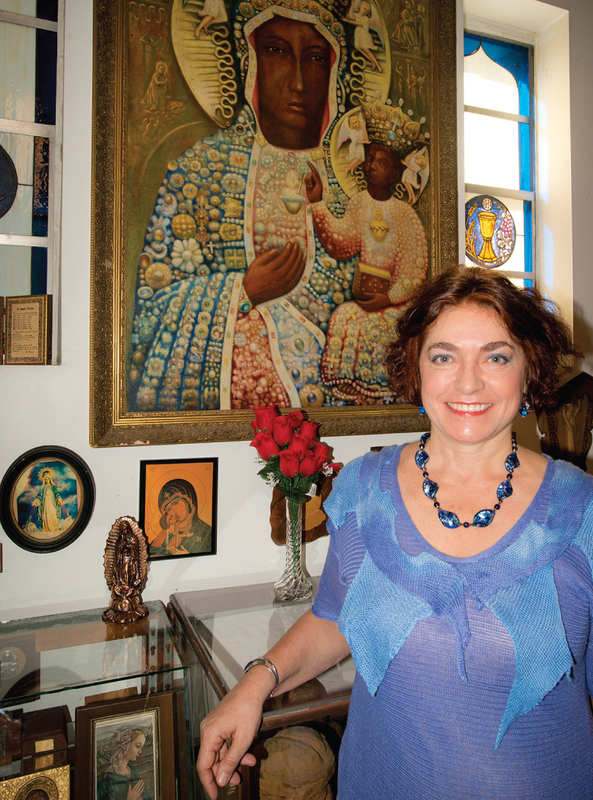 Dr. Oleszkiewicz-Peralba believes that, in addition to her mystical and agricultural connotations, the Black Madonna also speaks to an ancient cultural memory of the African origins of humanity, representing the original mother of Earth’s children. “It is a memory that people all over the world carry. 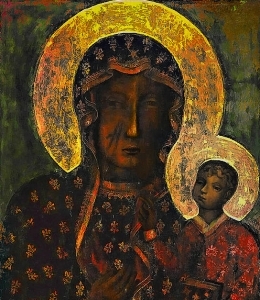 Because of this, blackness has a very strong symbolic meaning connected to love, nurturing, protection, transformation, power, wisdom, fertility, and justice.” Perhaps this collective memory contributes to the fact that the dark-skinned representations are the most revered icons in Mariology, and that the darker the skin, the more devotees and the higher the number of miracles associated with the icon. Top, from left: Our Lady of Czestochowa, in the shrine of Eureka, Missouri; Our Lady of Guadalupe; Egyptian goddess Isis with Horus, (©Brooklyn Museum/Corbis). Bottom, from left: Venus of Laussel (©Charles & Josette Lenars/CORBIS); Baba or Zywa—goddess as the center of a flowering Tree of Life; Guadalupe Defending Xicano Rights, by Ester Hernandez (©1976 Ester Hernandez. All rights reserved. Reproduced with permission of the artist). Syncretism, defined by Dr. Oleszkiewicz-Peralba as the blending of multiple cultural traditions giving way to a novel form of expression, implies both continuance and forgetting. While the Mother Goddess’ transference to Christianity brought with it a degree of institutional erasure, her presence continues to effect an irrevocable impression on human consciousness in the West through the figure of the Black Madonna. Dr. Oleszkiewicz-Peralba’s upcoming book, currently in manuscript form, is an extension of her Black Madonna research and focuses on representations of fierce feminine goddesses throughout Europe, Asia, and the Americas. “Most of these strong female figures have been either sweetened, demonized, relegated to fairytales, ridiculed, or dismissed. Kali is the only one that is still exalted and worshipped as a goddess in India,” she says. Perhaps one day the Black Madonna will regain her throne as the acknowledged Mother Goddess, the progenitor of reality, humanity, and the unifying element among spiritual traditions both ancient and modern. But for millions of devotees the world over who worship her, no such wait is necessary. Knowingly or subconsciously, these individuals practice a powerful form of worship that connects them to the very roots of humanity and even beyond, to the origins of the universe itself.